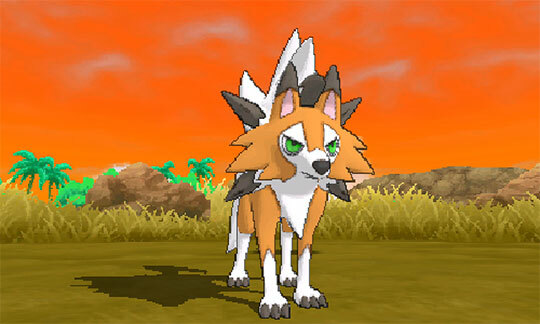 The Japanese variety show Pokénchi has revealed the first news for the upcoming Pokémon Ultra Sun and Ultra Moon since June, the debut of a third form for the Pocket Monster Lycanroc. This new form is its Dusk Form in the English games and Twilight Form in Japan. In design terms, its appearance combines elements of the existing Day (lower right) and Night (upper left) forms introduced in Pokémon Sun and Moon, but little else is known about the creature. It will retain Lycanroc’s Rock typing. The announcement preceeded the debut of the new form in the Pokémon anime this past week, where Ash’s Rockruff (the pre-evolved form) will evolve into just that. No word on the whereabouts of a potential Dawn Form, but Ultra Sun and Ultra Moon launch worldwide on November 17th, leaving the door open for further surprises like this.